i think Umezawa's Jitte will eventually be unbanned as well, so thats the first obvious equipment. the "swords" cycle like Sword of Feast and Famine are also really good, especially on double strikers. modern has a ton of good creatures that can hold equipment, and just so many ways of "cheating" those equipment onto a creature, i'm honestly surprised someone hasn't figured out a way to break it already. i'm honestly baffled by people here saying that modern doesn't have good equip users. 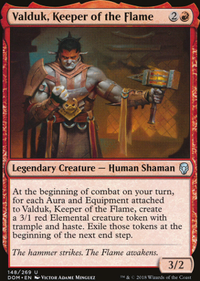 theres Kor Duelist , Swiftblade Vindicator , Vault Skirge (an artifact creature that helps get metalcraft working for Puresteel Paladin or Mox Opal ), Champion of the Flame , Valduk, Keeper of the Flame , and Kazuul's Toll Collector . lets say you have a double striker equipped with Sword of Feast and Famine , and a Sigarda's Aid in play. you attack, deal first strike damage, untap lands and opponent discards a card. then before normal damage is dealt you flash in an equip (such as a different sword), attach it to the creature for free, then deal normal damage and trigger the effects of both swords. seems good to me. you need some form form of card draw and Insolent Neonate just filters your hand, so maybe adding Dragon Mantle would help a bit on Champion of the Flame and Valduk, Keeper of the Flame . 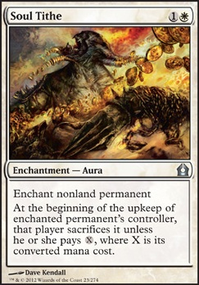 if you get to many lands on hand after the early game i suggest Magmatic Insight or when you got nothing usefull or no hand at all as well as being an instant Dangerous Wager or Wild Guess . Kazuul's Toll Collector seems like an okay addition. (keep in mind i havent tested Magmatic Insight nor Kazuul's Toll Collector in any deck). Interesting deck idea, i think you should capitalise on the whole historic mechanic, since you have a good engine base here, its just a bit messy. 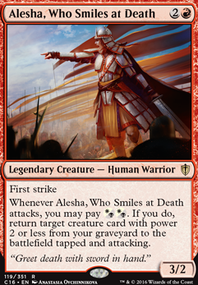 I think cards like Weatherlight and Board the Weatherlight would be useful here, as well as increasing Danitha Capashen, Paragon to a 4 of, Jhoira, Weatherlight Captain to a 3 of, Valduk, Keeper of the Flame to a 3 of and Shalai, Voice of Plenty to a 2 or 3 of. Shes very strong. Of coarse this means dropping some non legendary creatures, like Champion of the Flame , Adanto Vanguard and Storm Fleet Sprinter , i like Siren Stormtamer in here for protection. 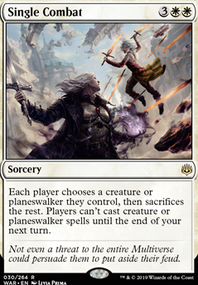 omg and you can use Urza's Ruinous Blast effectively too! Thats real nice. Now with this Legendary synergy going on, I think 3 Blackblade Reforged is your best equipment! I'd drop the 2 Short Sword for the extra two copies. 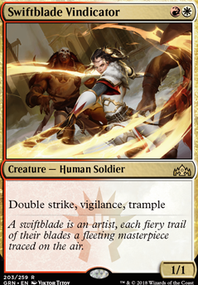 I also like Forebear's Blade over Sigiled Sword of Valeron so its up to you which one you want to run, but you'll want 2 copies over 1 of each, in my opinion. I like being able to move the equipment for free on Forebear, but making dudes with Sigiled Sword is good too. Your call here. 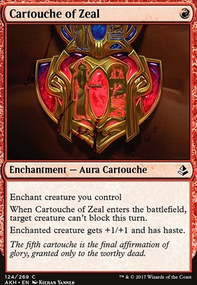 What do you think of Dub and Frenzied Rage for potential auras? I just dont like Aether Tunnel, but if thats been working for you then keep it! And yes, i hope you pull well for the land base, it will speed it up immensely! Nothing like nuking your own Champion of the Flame when you play Path of Mettle Flip. Def a build around card. Another cheap monster since you have alot of equipment and running Champion of the Flame in your deck you should add Goblin Gaveleer he is a 1 cost 1/1 trampled and gets +2/0 per equipment attached. Thx! Good idea, the instant speed of Fling isn't really (i think). 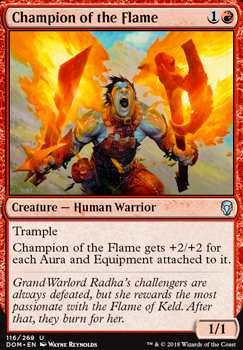 Also with the lower cost you can finish of low health targets with a buffed Champion of the Flame or a different creature a bit easier.